ABC's Cougar Town returned for its abbreviated 15-episode third season on Valentine's Day, a move that also saw the sitcom shift from its original Wednesday night slot to Tuesdays after Tim Allen's Last Man Standing. And as we near the one hour season finale on May 29, there is still no word of a fourth season renewal from the network, despite whispers that TBS would pick it up if Cougar Town was cancelled. Even though it feels as though the show that is better than its terrible title is in a state of limbo, that doesn't mean creators Bill Lawrence and Kevin Biegel can't still have a laugh at their own expense thanks to a familiar face providing the pull-quote for this week's title card. 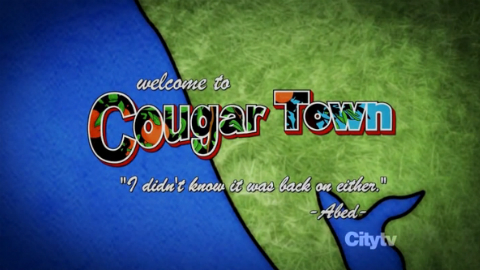 "Down South" opened with a the announcement of a 'hurricane party' before cutting away to the opening titles which featured the (textual) return of Community's Abed Nadir to Cougar Town. The two programs share an odd history that began with the NBC character played by Danny Pudi often ranting about how good the ABC comedy really is, and how it's a shame to see it so often dismissed because of its name. It's such a bad name. Then came his hilarious cameo on Cougar Town and his character once again monologuing about the show during Community's My Dinner With Andre spoof called "Critical Film Studies." The two are just inseparable. The inclusion of the quote might not be just an innocent gag, though funny it also highlights the very little promotion that ABC does for the fledgling series. I mean, if a huge fan like Abed isn't even aware that the show was back on, how can you expect viewership to maintain let alone increase. Could Lawrence and Biegel be not so subtly suggesting that the network hasn't done the show any favors when it comes to attaining the kind of ratings needed to obtain a fourth season? And in a nice coincidence, Community received its renewal only a day before this aired so maybe there is still hope for Cougar Town to stay located on ABC. Here's Kelly's plea for you to 'Do It For Abed and Give Cougar Town a Chance', which also contains a video of all the Community-Cougar Town crossovers. Minus this one. Cougar Town airs Tuesdays at 8:30 p.m. ET on ABC. It stars Courteney Cox, Busy Phillips and Dan Byrd. It was created by Bill Lawrence and Kevin Biegel.